Belladonna d'Avalon (Belafonte d'Avalon x Piping Hot/Pablito). 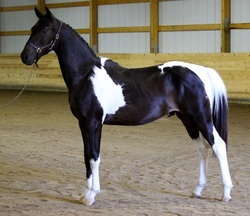 Bella is a 2014 black filly that is exhibiting all the style and boldness of her sire wrapped in a beautiful black package. She will making the trek to Canada to her new owner next year. Black Ice at his RPSI foal inspection - August 27, 2014. He is owned and was bred by Katherine Piatt. Big Bang SLF is growing up! Pictured at two, he was bred by Susann Jones. Introducing KF Soldier of Fortune. Bred by Sharon Michael of Kaleidoscope Farm and owned by Suzanne Hopf. He is out of the Connemara mare, Kaleidoscope's Megan. Congrats to his breeder and his owner for such a lovely, lovely colt! This stunning colt is showing all the signs that he wants to follow in his father's footsteps. Shown below in the video at just a few weeks old, jumping not only proved to be NO problem, it was something to do for FUN! Big Bang is available for purchase from his breed. Please contact Susann Jones for more information on this guy! 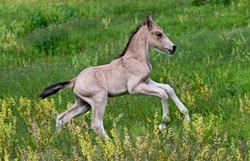 Bring It - Belafonte's first foal was born May 2nd - a Buckskin colt out of the German Riding Pony mare Onjalei Dancer. He scored Gold Premium at his RPSI Inspection. Owned and bred by Dianna Orana of Fox Creek Farm, this colt is available for purchase. 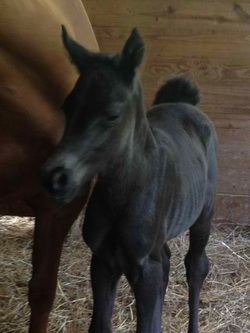 Congratulations to Dianna on such a lovely foal!